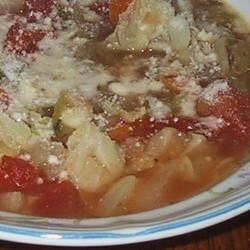 "Riboletta, roughly translated in Italian, means re-boiled minestrone soup with bread slices in it. You could add your own diced cooked meat to it if you like." In a large saucepan, heat the olive oil over medium heat. Cook the onions, garlic, celery and carrot until the onion is soft. Stir in bay leaf, parsley, chicken stock, water, tomatoes, thyme, cabbage, potato, and cooked beans. Bring to a simmer and cook for about 40 minutes, or until beans are tender. Season with salt and pepper to taste. Preheat oven to 350 degrees F(1175 degrees C). In a 4 quart casserole dish, place 1/3 of the mixture over the bottom. Layer 3 of the stale pieces of bread over the top. Place another 1/3 of the soup mixture over the bread followed by remaining 3 slices of bread. Top with remaining 1/3 of soup. Sprinkle with Parmesan cheese and bake for 30-40 minutes, or until soup is bubbling and cheese is light golden. See how to make a healthy Italian-style white bean soup with fresh spinach. Great soup! The combination of tastes is delicious! Super good, I didnt have parsley so I added a bunch of oregano instead and was liberal with the pepper. It turned out great!